St. Martin/Maarten has no shortage of beaches. Known as the island of turquoise waters, St. Martin/Maarten is host to 37 beaches in total, embedded between the Caribbean Sea and Atlantic Ocean. Whether you prefer to relax and sunbathe, or dive and surf, St. Martin/Maarten has a beach for you. This beach is ideal for visitors wishing some peace and tranquility, where one can snorkel or surf depending on the sea. Facing the Caribbean Sea, one can see the island of Anguilla easily. One of the most popular beaches on St. Martin/Maarten, this beach was named aptly for his red coloured sand. Swim through a small rock arch and enjoy some time on a small secluded beach at the base of the cliffs. This beach is just down the road from the Butterfly Farm, and is a great beach for small children. With a very gentle slope towards deeper water, you can literally walk out 70 feet and still be only in three feet of water. With restaurants close by, and wind surfing rental and instructions for older children, this beach is ideal for the whole family. A unique beach that includes a small lagoon. One beach faces the Caribbean Sea, while another surrounds the lagoon. The lagoon beach provides many shaded areas thanks to beautiful palm trees surrounding the area. The ultimate in privacy… this beach is so named as it can only accommodate two people at a time! A family-friendly beach, the very scenic beach is fairly sheltered. During the day vistors can relax, and by night one can move to the sounds of rock and reggae. During a full moon, Kali’s Beach Bar hosts legendary parties. This remote island provides a fun day-trip, where 2 beaches await visitors of all ages. One side is ideal for families with calm waters and two restaurants to enjoy the local cuisine. The second beach faces away from St. Maarten and provides a stony hike for the active traveller. Pinel Island is accessible via a short 10 minute boat ride. This beach is one of the longest beaches on St. Martin/Maarten. Resident pelicans will ensure you feel like you are paradise. Flying enthusiast can journey to the Dutch side of the island to enjoy spectacular approaches of large aircraft at the famous Maho beach, where aircraft and sunbathers are mere meters apart. Beautifully appointed MAC Caribbean villa Jardin Creole awaits the discerning visitor looking for a little piece of heaven in St. Martin/Maarten. Located on 2.5 acres in the exclusive Terres Basses area and just a 3 minute walk from Plum Bay Beach, this luxurious 5,000 square foot villa offers generous Caribbean Sea views and ensures a tranquil oasis to allow you to recharge and relax. 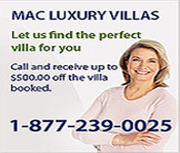 Look no further than MAC Caribbean for your vacation lodging. Let us help you relax in style.